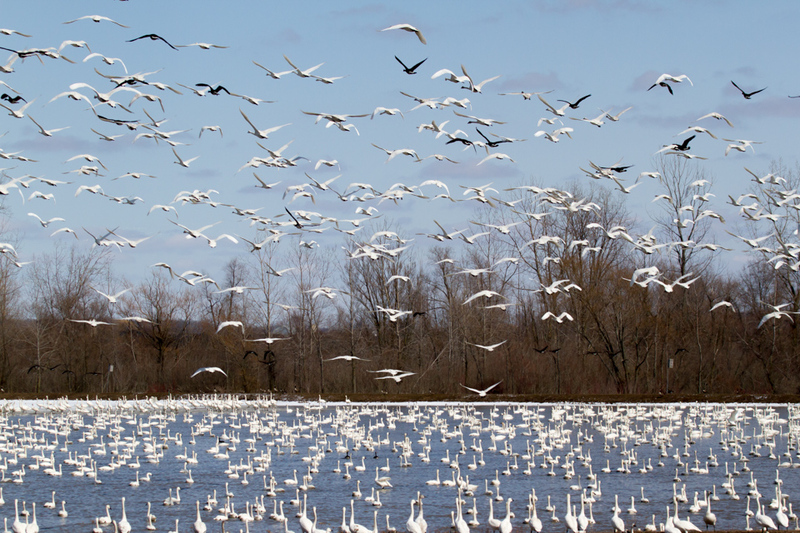 I spent time with the magnificent tundra swans in 2013 during their annual migration. 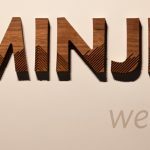 The result: A slide show, a short video, and my field report. Enjoy, and feel free to comment. At one staging ground, near Aylmer, Ontario, farmers donate corn to help them replenish. Hear the music, the thunder of the wings. 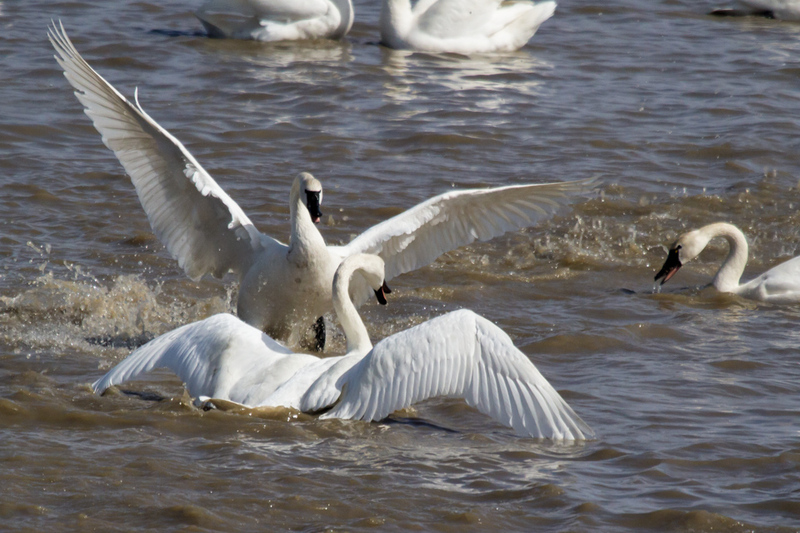 Swans thrive in the cold, but they do need open water. I chose this shot because I wanted you to feel the cold of the morning. 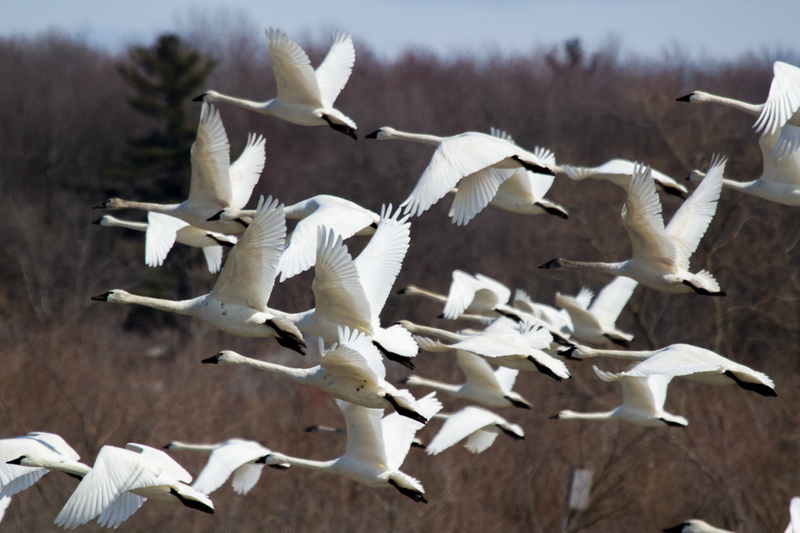 Each year, just at the first hint of spring thaw, massive waves of tundra swans begin a long and arduous migratory trek from the Chesapeake Bay area, where they winter, to the Beaufort Sea in the Arctic, where they breed and nest. These magnificent birds aren’t known to most Canadians, for they travel a narrow corridor and their fly-past over the vast land is brief. A few days to rest and replenish at various locations in Southern Ontario and Manitoba—but no more. The imperative of an ancient clock calls them to keep moving north. 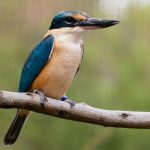 When they arrive at their summer grounds, they then have a precious few weeks to breed, nest and ready their fledglings for the 3,000 km return flight back in the fall. I had been promising myself for several years to witness these magnificent birds. This year I kept my promise. The day begins with cold sleet and a driving wind. We have come to an open-water bog in the municipality of Lambton Shores, by Lake Huron. 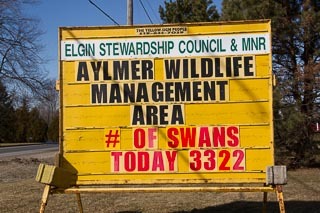 The swans, Cygnus columbianus, have already gathered by the thousands. We hear before seeing: a cacophony not unlike geese but measurably different to the ear. Mellower. Each bird has about 2,500 feathers and the in the subzero temperature, they are clearly doing better than I am. 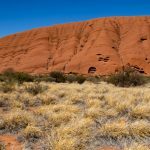 Exposed fingers fumbling with photographic equipment quickly numb. I convince myself that the cold is essential to the authenticity of the experience. I need little convincing. I’m in their territory now. 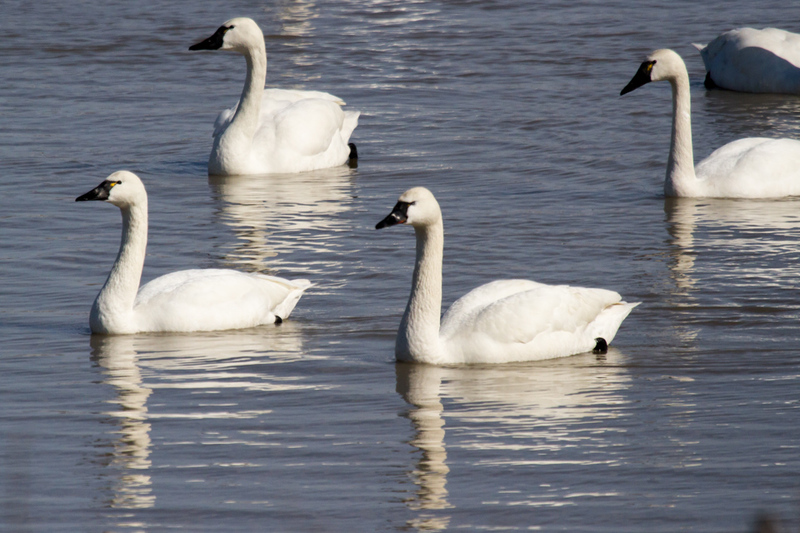 Despite the increased pressure on many bird populations, the tundra swans are not considered threatened. 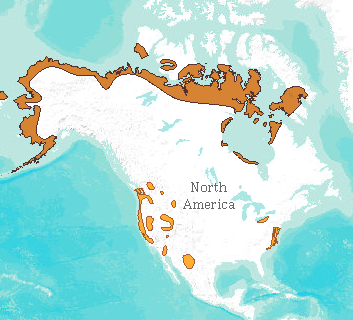 Worldwide, their numbers stand at more than 300,000. Looking at them now, and as you can see on the video, they are healthy, active, energetic, at times even raucous despite having just flown non stop for 800 km. They are hungry, though. 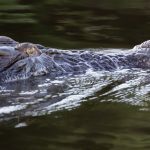 And they forage constantly for whatever they can find, dipping their long necks below the surface of the open water for plant material or, if they are lucky, finding corn kernels, thanks to the donations of local farmers. I’ve been at the bog now for several hours. Inexplicably, I get a sudden appreciation for Charles Darwin. He left once in 1838 to do some observations and didn’t return home for five years. And with no fancy technology. Just a notebook. I’m cold and hankering for a Tim Hortons. But I’m pleased with the photographs. Today I’ve moved closer to Lake Erie, just outside the town of Aylmer, Ontario. Here, the local conservation authority has put up a few blinds, which allows for much closer views. According to the sign, more than 3,000 birds are here today. I have no idea how they’re counted. The weather has turned warmer. It’s a Sunday and families are making a day of it to come out to watch. Swans usually mate for life. But that doesn’t stop them from engaging in an elaborate courtship ritual: mates face each other, extend their necks, bob their heads, flutter their wings and call out to each other. You can see a few examples of the behaviour in the video above. I am spectator to an elaborate ballet and only the cast understands the choreography. Apart from size, there is no visible difference between males and females (or cobs and pens to be be technically precise), but it’s easy to spot juveniles: their necks and bellies are taupe instead of white and they lack the small but distinctive yellow patch at the base of the black bill. 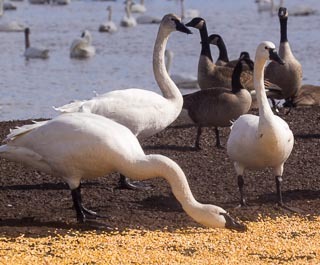 Tundra swans are intimidatingly large birds, reaching up to 9.5 kilos with a 2 meter wingspan. Beside them, the Canada goose looks diminutive. 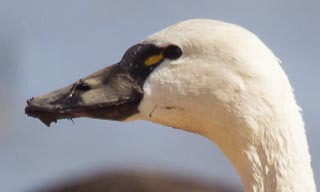 Note the yellow mark on the beak near the eye. One of the blinds has tinted glass windows. The swans, unable to see inside, are unafraid to approach. 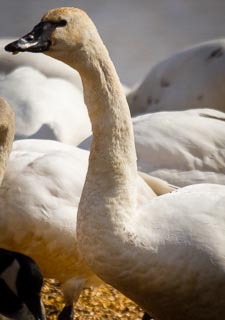 The close-up opportunities are a photographer’s dream, but ultimately the glass is a barrier: the sound of the swans is muted, there is a loss of connection, less intimacy with the birds. A woman from Tillsonburg has her camera on 4-frames-per-second automatic and shoots continuously until her memory card overflows. And a six-year old starts agitating. Time to leave and rejoin the flock. So many of us live so much of our lives behind glass—sheltered from, unconnected with the natural world. Perhaps that is why we have difficulty grasping the effects we have on it. At one point near the end of the day, the birds, as if heeding the baton of an unseen conductor, began gliding in unison in one direction. Then they suddenly took off, the powerful wings thundering through the air. The video attempts to capture a few frames of this phenomenon. I had been with the swans for some time now. And felt honoured, humbled grateful, privileged. And I shouldn’t be too quick to judge the woman from Tillsonburg. In the two days, I’ve taken 1,900 photos and video clips. Sometimes serene . . . Extraordinarily social birds, they gather by the thousands. After a week or 10 days, the swans are ready to move on. The migratory mechanism, not fully understood, pulls the swans northward.